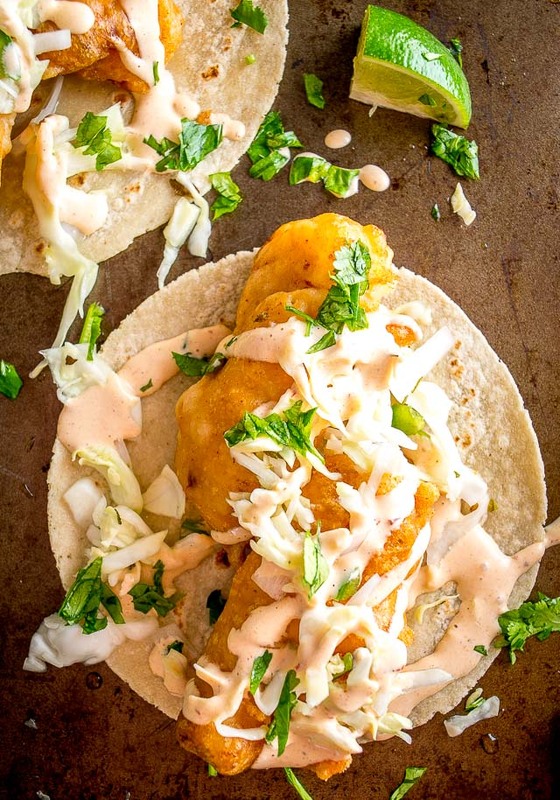 The closer you live to the seaside communities in Baja California, the closer you’ll be to the original incarnation of Baja Fish Tacos: fried fish, sharp cabbage, and some gooey creamy spiciness. 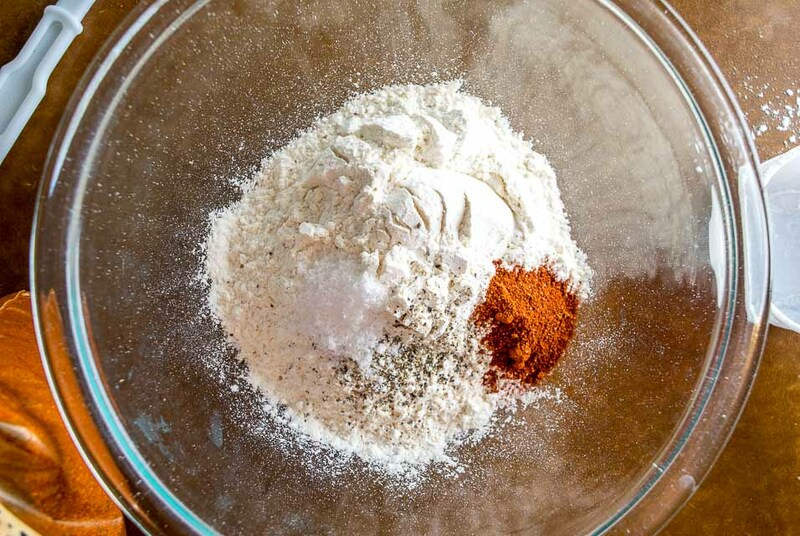 The farther away you get the more varied the interpretations will be, but luckily it’s easy to whip up an authentic batch without booking a trip to Baja. Keep the original specs in mind and your family and friends will be very happy with the day’s catch. Giving the cabbage some acidity adds another layer to these tacos, so we’re making a half batch of cabbage-only Curtido. 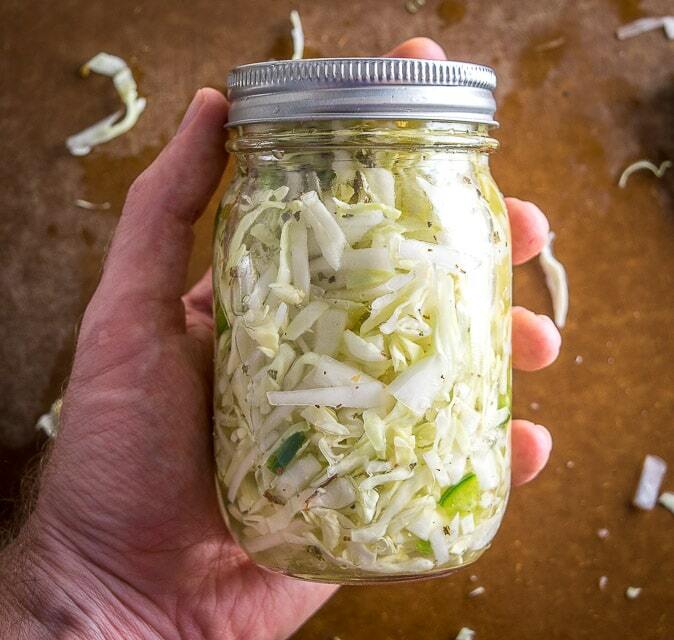 Curtido is a fiery, pickled slaw, but you can consider this step optional — tossing the cabbage with some seasoning and lime juice would work well too. Curtido typically needs time to pickle (usually overnight), but it will still give you some twang even 15-20 minutes after making it, so we’ll get a batch started before making the fish batter. This should all fit into a single Mason jar, including the vinegar-water mixture. Cover and give it a good shake, letting it rest in the fridge until you need it. It’ll be much sharper tomorrow but I think it’s still worth making it even if you want to use it a half hour from now. 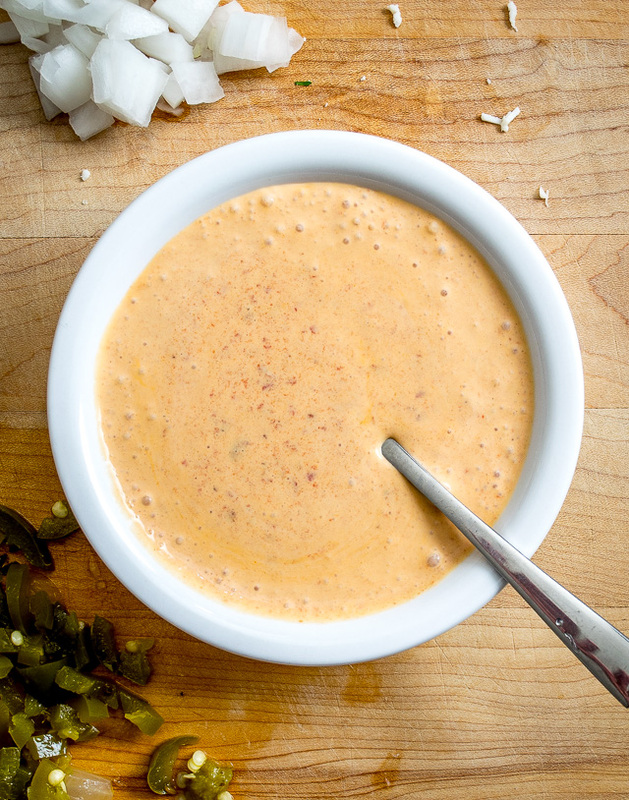 If you’re new to Chipotle Crema you’re in for a treat! It’s the perfect fit for these tacos, but it’s so good that you can use it on just about anything (including these improvised Cuban sandwiches). You can also substitute some or all of the mayonnaise with plain Greek yogurt if you want a lighter version. 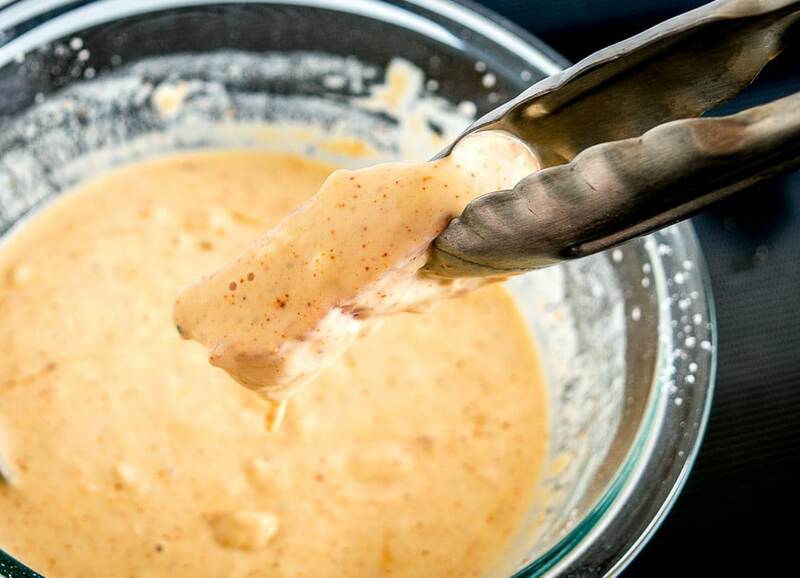 For example, you could use 3/4 cup plain Greek yogurt and 1/4 cup mayo and still end up with a great tasting sauce. If you want to go all the way and use 100pct yogurt, keep in mind that adding even a pinch of fat will make it taste infinitely better — a tablespoon of mayo or heavy cream will do the job. We’re using a pound of fresh mahi mahi. But you’ve got lots of good options, with cod, tilapia and catfish being common picks for deep frying. 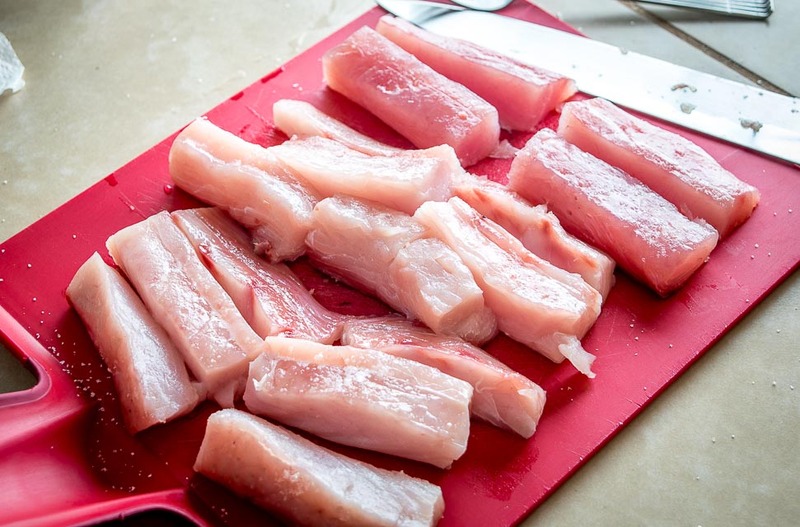 Season the fish on both sides and cut into strips in the realm of 1″ x 3″. Beer is the preferred liquid for this batter as it leads to lighter, crispier tacos (why beer?). I’m using some of this chili powder, but you can consider this optional, seasoning the flour with salt is more important. Combine this mixture well and then add 1 cup of beer. 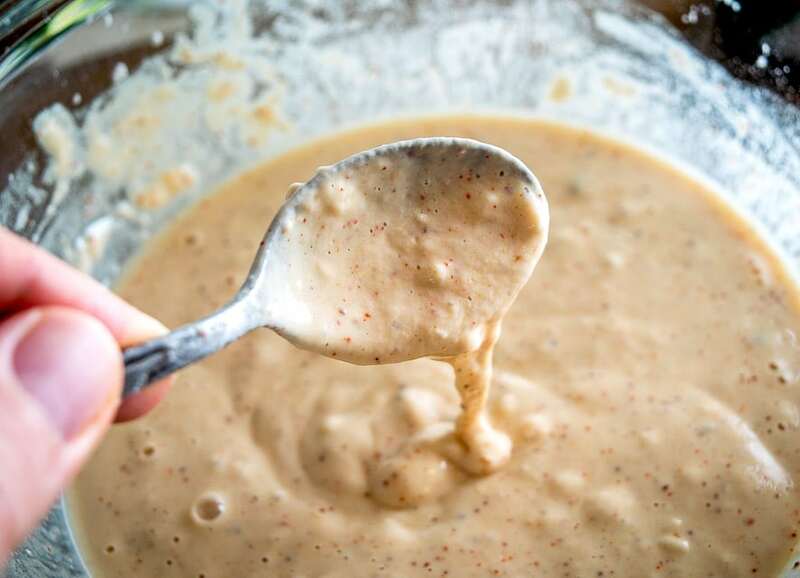 Whisk together until you have batter that resembles thick paint. You might need to add more beer to get the right consistency, I added an additional 1/4 cup of beer to this batch. If, like me, you cringe at the thought of a huge vat of frying oil in your kitchen, then use a narrow, deep saucepan and you’ll only need a few cups of oil to make these tacos. The key is to get the oil up to 350-360F before putting in the fish. 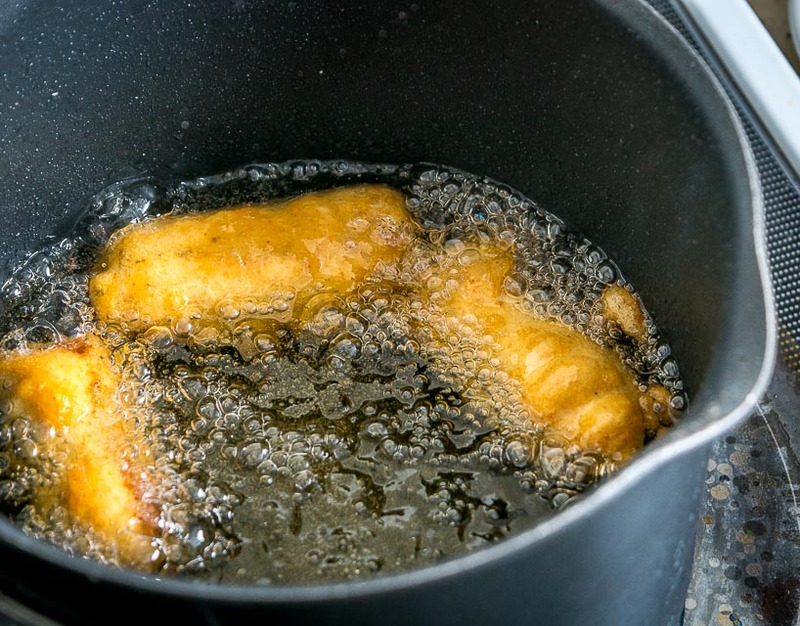 Frying fish in oil that is too hot, or too cold, is a massively frustrating experience. 3-4 minutes in 360F oil does the job quite well, with crispy exterior and fully cooked fish inside. 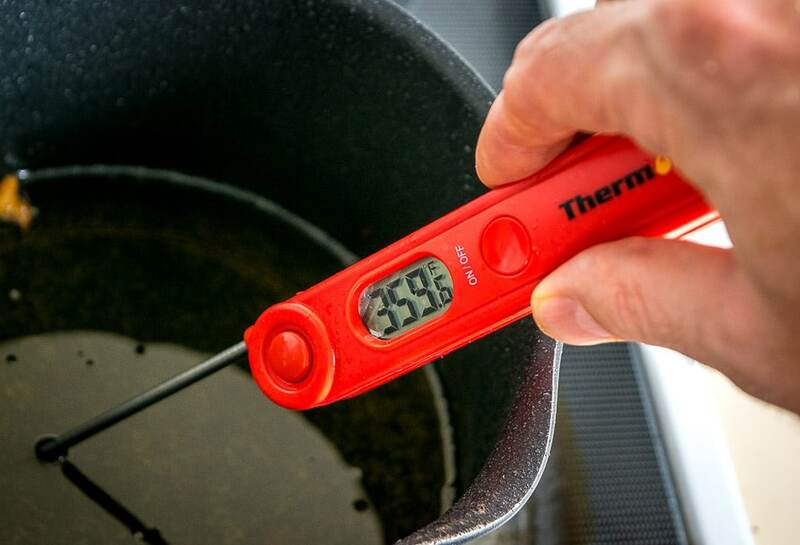 If your exterior is browning too quickly then your oil is too hot, if the interior isn’t cooking all the way through then your oil is too cold. If you don’t have a kitchen thermometer it’s worth adding one to your list — you can get them super cheap from Amazon. Otherwise, I’ve found that a setting of 6/10 on my electric stove will keep the oil at approximately 360F once it has heated up all the way, but of course stoves will vary. 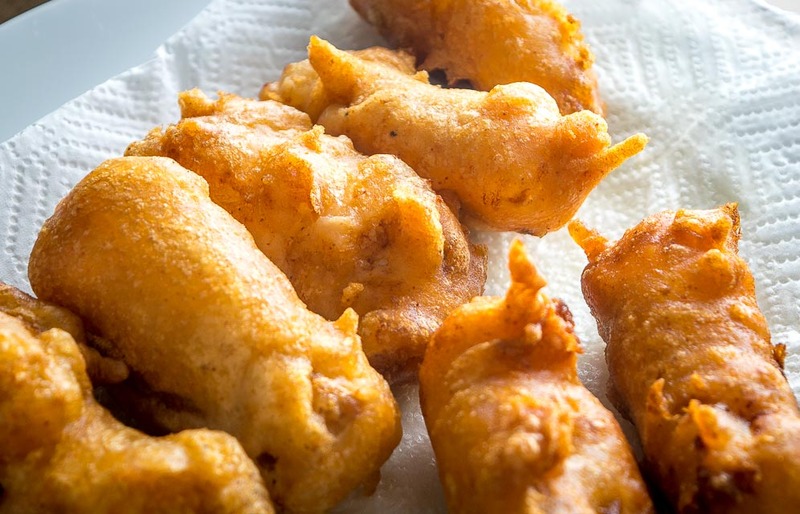 Coat each fish stick with batter and gently add them to the oil. Since we’re using a small amount of oil, cooking only 3-4 pieces at a time is the best route — if you add the whole batch the oil temp will drop too much. If the oil is shallow in your pan be sure to flip them once about halfway through cooking. Once the exterior turns a deeper brown remove them carefully and set them on some paper towels to drain. This batch needed about 4 minutes per round to cook. Continue cooking as many as you need. This single pound of mahi mahi made 16 pieces of fried fish that could easily double as the world’s strongest human magnet. As with all fried foods, they have a limited window where they are crispiest. A couple minutes after taking them out of the oil, they will have cooled a bit and are ready to eat with a crispy exterior and moist fish inside — nice! 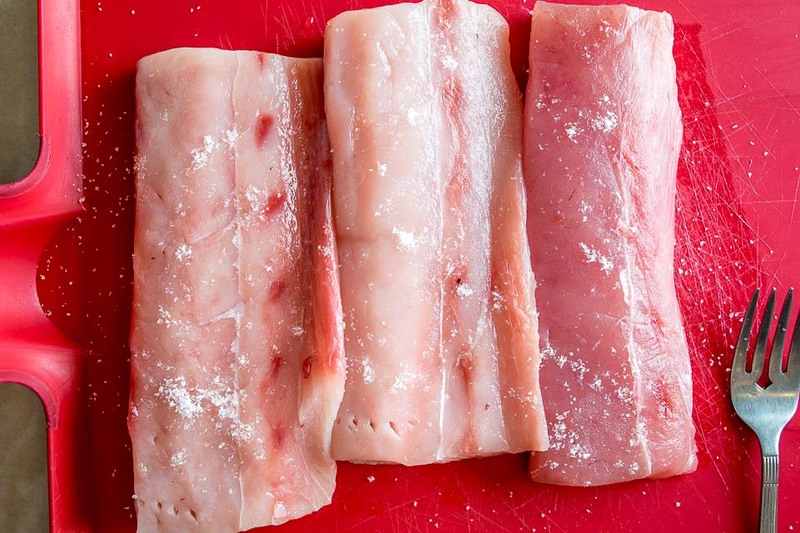 If you let them sit for too long before serving the exterior will start to get soggy as the heat of the fish will steam the crust from the inside out. One way to combat this is to get them out of the draining pit as soon as possible. So once the oil has drained off into some paper towels, put them on a wire rack in a 250-300F oven until you need them. This can extend their life a little bit and it’s a good option to keep in mind if you’re making a big batch. Okay, now it’s time to warm up some corn tortillas. If the oven is on stick the tortillas in for a few minutes, otherwise you can nuke them in the microwave for 60 seconds or so. Each tortilla gets fried fish, chipotle crema, pickled cabbage, and a final squeeze of lime. 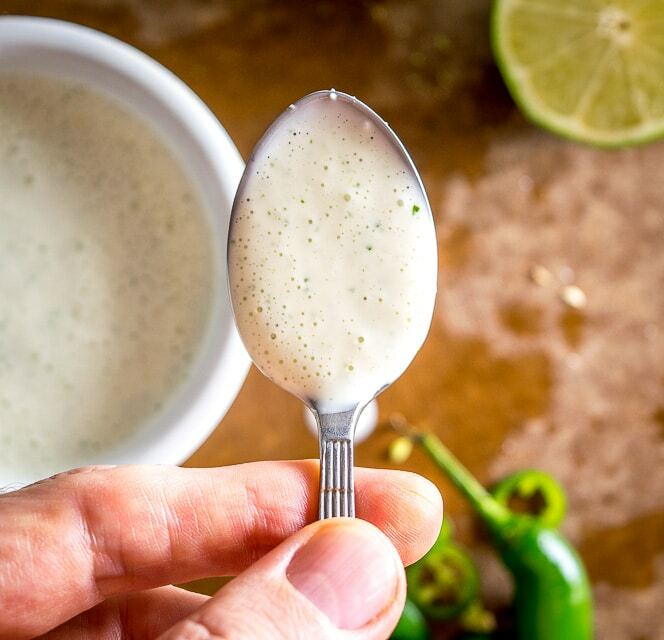 The final squeeze of lime is a delicious final touch so don’t skimp on it! And if you made the Curtido use a fork to take it out of the jar so that you get mostly cabbage and very little liquid. Fried fish is a rarity for me and I think it should come with special permission to make them as goopy as you want, so feel free to load up on the Chipotle Crema and any other fixings that sound appealing to you. 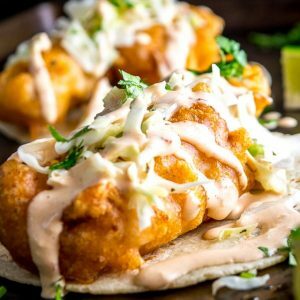 These Baja Fish Tacos have incredible flavor and will quickly whisk you away to a lazy seaside town. And you might want to stay forever. I’ll put the recipe box below with all the juicy details — feel free to ask any questions in the comments section below. For up-to-date recipes follow us on Facebook, Pinterest, or Instagram. 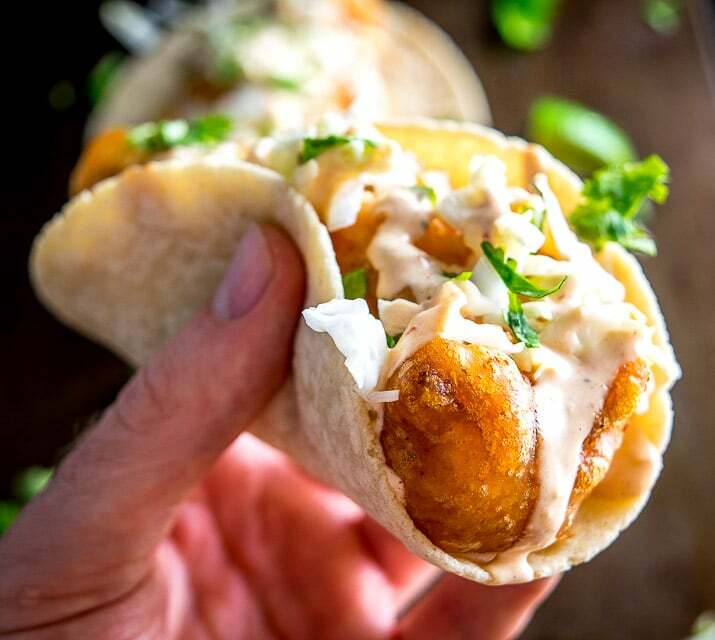 It's tough to beat fried fish drenched in a Chipotle Crema sauce. 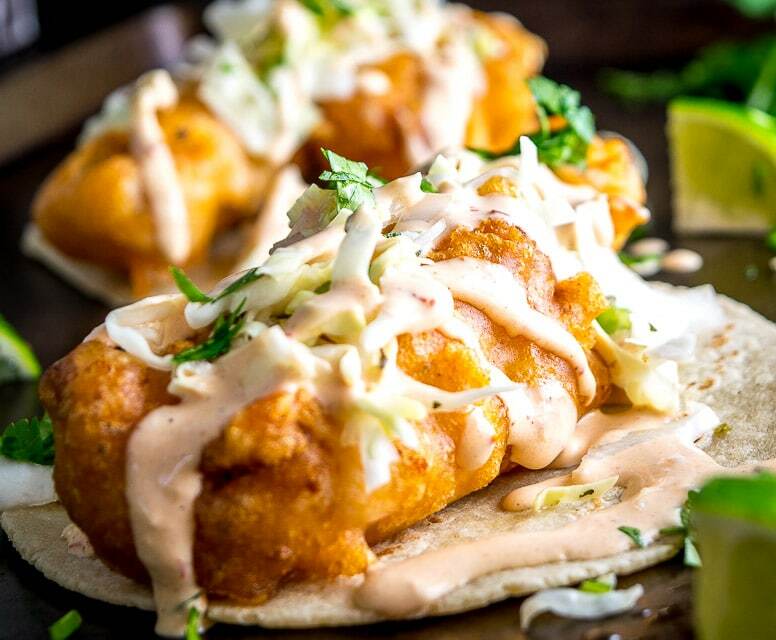 These Baja Fish Tacos are also served up with a batch of pickled cabbage -- too good! 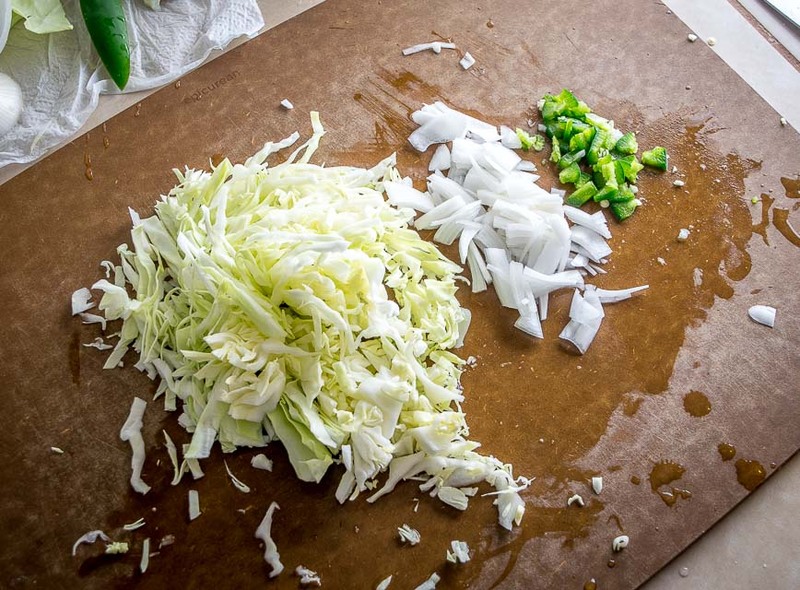 If you're making the Curtido, start by slicing up the cabbage (approx. 1/3 head), 1/4 onion, and 1/4 jalapeno. Add them to a mixing bowl along with the remaining ingredients: 1/2 cup vinegar, 3/4 cup water, 1/2 teaspoon Mexican oregano (optional), 1 teaspoon of salt, and some freshly cracked black pepper. Combine well and add everything to a Mason jar. Give it a shake and let it rest in the fridge until you need it. 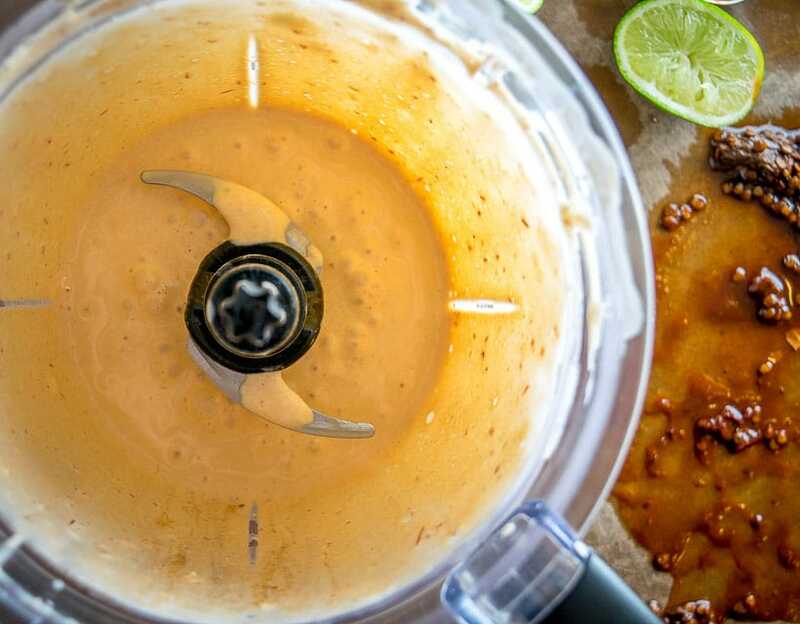 For the Chipotle Crema, add the following ingredients to a blender or food processor and combine well: 1 cup mayonnaise, 2 chipotles in adobo, 2 garlic cloves, pinch of salt, and a squeeze of lime. You might need to add a splash of water to get it to combine. If you want more heat you can add more chipotles or some of the adobo sauce. Keep in mind that you can substitute some of the mayonnaise for plain Greek yogurt. Pat dry and season the fish on both sides with salt. Cut into strips that are approximately 1" x 3". Preheat 3-4 cups of oil in a saucepan until it reaches 350-360F (I used canola oil). 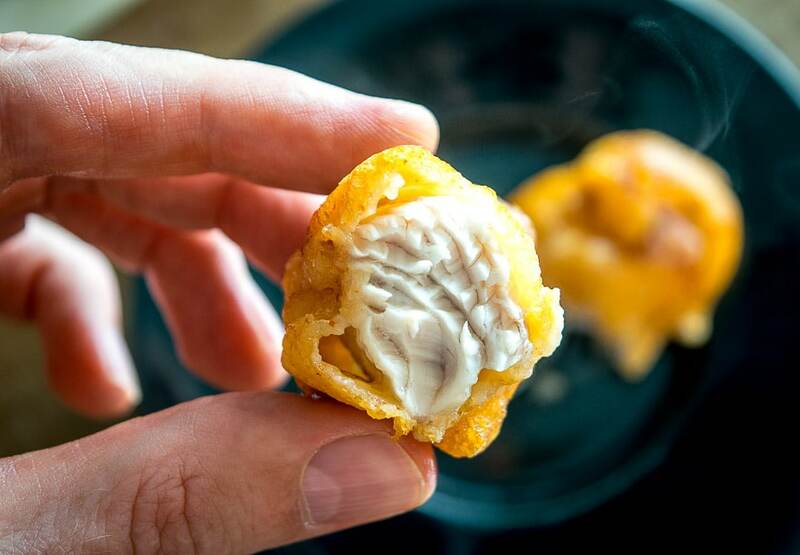 One at a time, dip the fish sticks into the batter and drop them gently into the oil. Let them cook for 3-4 minutes or until the exterior is turning a darker brown. I used a narrow pan and only cooked 3-4 pieces at a time so that the oil temp remained as close to 360F as possible. Carefully remove the fish sticks from the oil and drain them in some paper towels, continuing until all the fish sticks are cooked. If making a big batch, place the fish sticks on a wire rack after draining , this will help prevent them from getting soggy. You can optionally keep them in a 250-300F oven until you need them. Warm up the corn tortillas in the oven for a few minutes, or nuke them in the microwave for 60 seconds. Each tortilla gets fried fish, Chipotle Crema, pickled cabbage, and a final squeeze of lime. Enjoy! I used a single pound of mahi mahi, but you've got lots of good options for fish, with cod, tilapia and catfish being common picks for deep frying. Try to get the oil to 350-360F before adding the fish. A kitchen thermometer is a great way to accomplish this. On my electric stove, a setting of 6/10 kept the oil at that temp. One way to help prevent them from turning soggy after cooking is to get them out of the draining pit as soon as possible (or eat them soon!). You can also put them on a wire rack in a 250-300F oven until you need them. I typically scrape out the seeds before adding the chipotles. 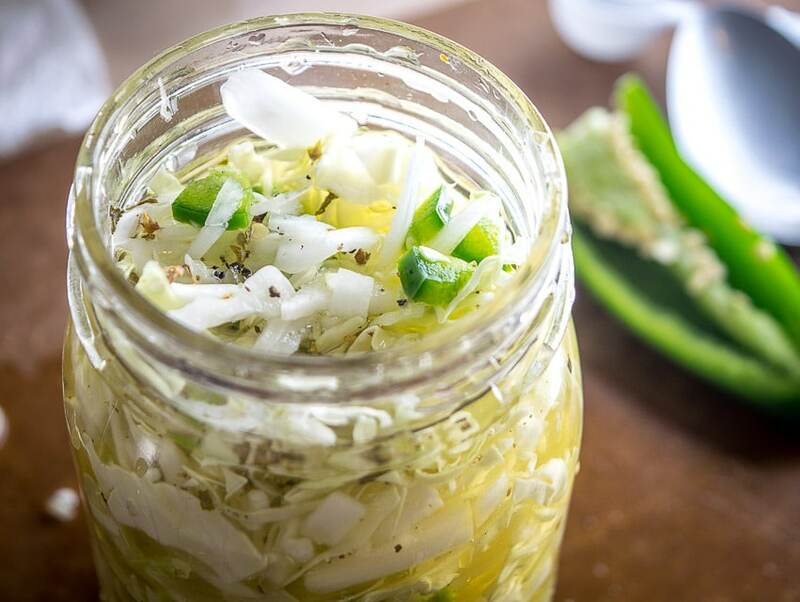 Curtido typically prefers to rest overnight before it is fully pickled, but you'll still get some twang from it even 15-20 minutes after making it. You could also top these tacos with a zippy Lime Crema. DefinitelyI will make this one. Thanks much Geronima, hope you enjoy the tacos! That Chipotle Crema sauce!!!!! These look so good! Thanks Debbie! I use that Chipotle Crema all the time, definitely worth making and don’t forget to add a bit of fat to it if you use yogurt. Making these tacos tonight, in Baja! What kind of vinegar do you suggest for the curtido? Awesome Jackie — wowsa you will probably have access to super fresh fish. I always use plain ol’ white vinegar for the Curtido. I hope the Bajas in Baja treat you well! We lived in Baja when I was 10-11. I have such fond memories of the fish tacos. I’m going to try these this week. Thanks for the recipe! Awesome Faye, you will love them! These were sooo good! I’ve been trying to recreate the Baja fish tacos my husband and I had when we were out west for our honeymoon and this has finally hit it on the head. Thank you! Awesome Rachel, so glad they worked out for you guys! These look so good Patrick, absolute yum! Patrick!! This recipe is ridiculously good. We love fish tacos, and I have tried dozens of restaurants as well as dozens of recipes. This one is the winner. I think the beer batter is what cinched it. We used trout and flounder that was gifted to us, and it was phenomenal. I can’t thank you enough! Thanks Angie, so glad the fish tacos worked out for you! Yeah it seems like the beer really helps them crisp up nicely. I grew up in S.Cali but have moved away to the Midwest and can’t really find food like S.Cali anywhere here! and I have had delicious fish tacos in Cali and my kids grew to loved them last year! And I been looking for a recipe and came across this one and let me tell so glad I did!!! The Chipotle sauce is so delicious along with the cabbage and fish is just the perfect combo and very authentic!!! Thanks Ana, I’m so glad you found the recipe! Simply awesome fish tacos for dinner tonight. Thanks for the recipe Patrick! We added some guacamole and roasted tomato/jalapeño salsa for a pile of goopy deliciousness. Five stars! Ooh sounds awesomely goopy, so glad it was a hit! This recipe looks very promising! With one important exception. Please do not heat your tortillas in an oven or microwave. Warm them on a comal a.k.a. griddle. Thanks for this great recipe. Can’t wait to try it. My husband has been missing authentic baja fish tacos for years. Made them and got 2 thumbs up. They were a hit! Thanks! PS I still recommend heating your tortillas on a comal/griddle. Thanks Sela, so glad these tacos were a hit! If you need 20 tortillas for dinner are you still heating them all up on the comal? Yes! Everyone I know does it that way, no matter how many tortillas. We keep them wrapped in a towel to stay warm as we heat the rest. But it may be different in other places. I’m looking forward to cooking some more of your recipes. They’re well-written with really helpful details and tips! Thanks! Okay thanks Sela. I hope you find some other keeper recipes on the site! Cheers. Is it spicy all together.. I’m feeding kids this dish tonight? Hi Jess! I think the Chipotle sauce is the spiciest part so if you want a milder version just use 1/2 chipotle in the sauce and give it a taste test, adding more if you want. Cheers. Oh awesome glad they liked it!